It's a familiar scene, at least for those of us NYC residents who work in certain neighborhoods of Manhattan and Brooklyn: a gaggle of Europeans or Midwesterners, idling smack dab in the middle of the sidewalk, shopping bags akimbo, stalwart leader poring over a tourist map... oblivious to the workaday New Yorkers swarming around them, en route to a big meeting or just out to coffee or lunch (to go, of course). We pride ourselves on our ability to navigate the city—most of us are happy to offer directions, power stride notwithstanding—yet there are times when we too are at a loss, chagrined to consult our smartphones for advice on how to get to that appointment above 59th St or that friend's place in the dark heart of Brooklyn or Queens. After all, we know all too well that the City suffers from a serious deficiency of pedestrian-friendly maps and signage. With all of the fanfare (and backlash) surrounding the launch of New York City's bikesharing program, few noticed that the dozens of Citi Bike stations—which started popping up seemingly overnight—also included brand-spanking-new infrastructural element along with the pylon-like bicycle docks. Indeed, the debut of Citi Bike this past May doubled as a quiet way to introduce an appropriately understated article of new signage that nicely complement the stations yet are not contingent on the bikesharing system by any means. 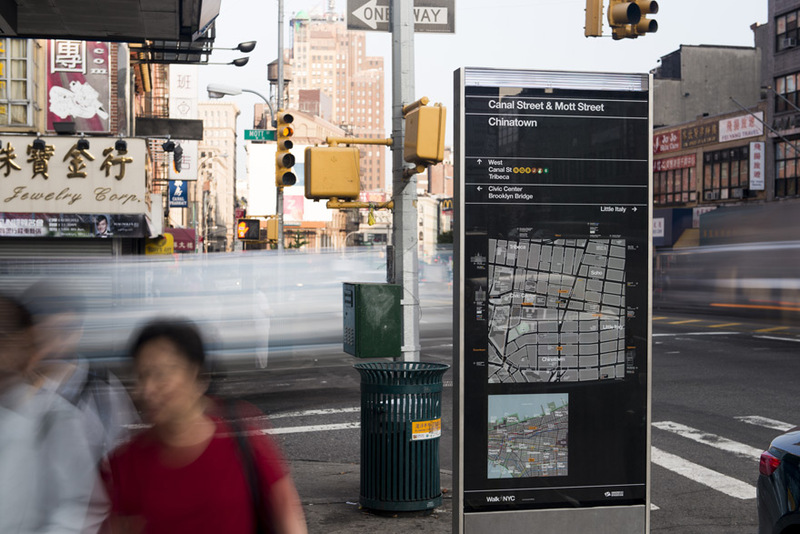 Of course, the new NYC Wayfinding System received more attention when it officially launched about a month later, starting with a few of the steel-and-glass monoliths popping up in Chinatown. 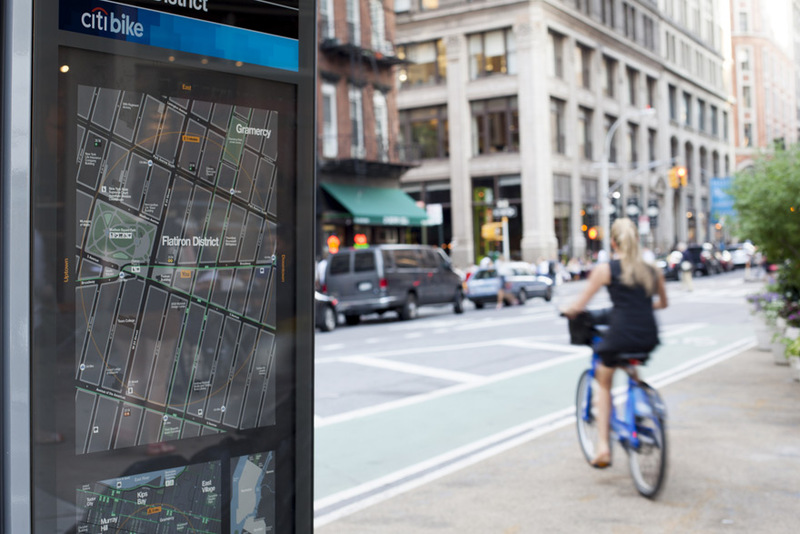 In addition to the minimalist maps at each Citibike station, WalkNYC signage is intended to facilitate navigating the city by foot—hence the name—whether they've just emerged from the subway or if they've pulled up curbside on a human-powered conveyance. 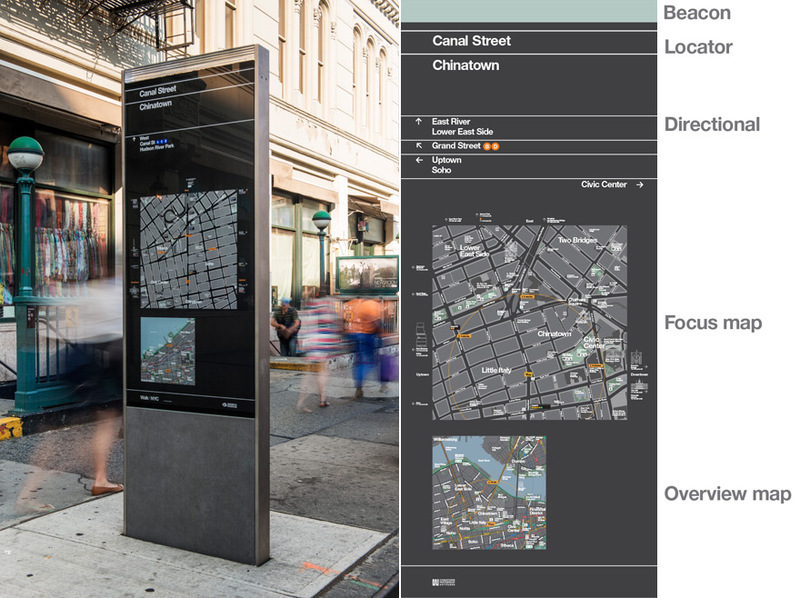 WalkNYC is New York City's standard for pedestrian wayfinding. 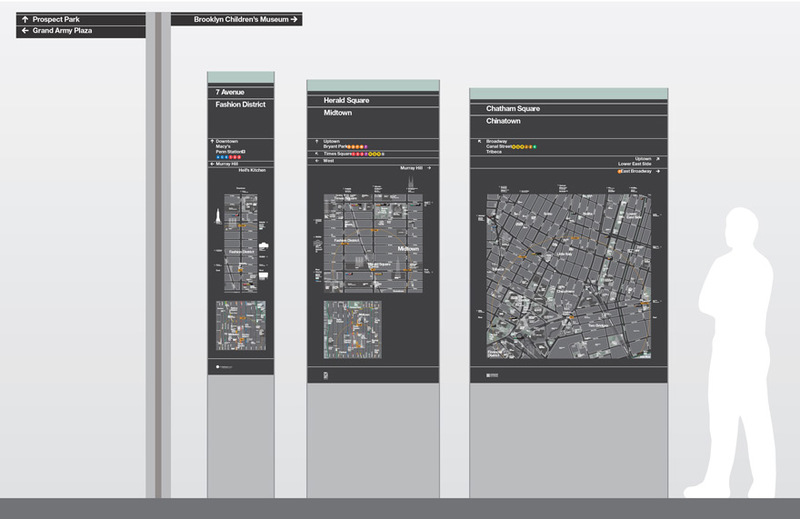 WalkNYC provides a clear visual language and graphic standards that can be universally understood, encourages walking and transit usage by providing quality multi-modal information, and provides consistent information across a broad range of environments in the city. 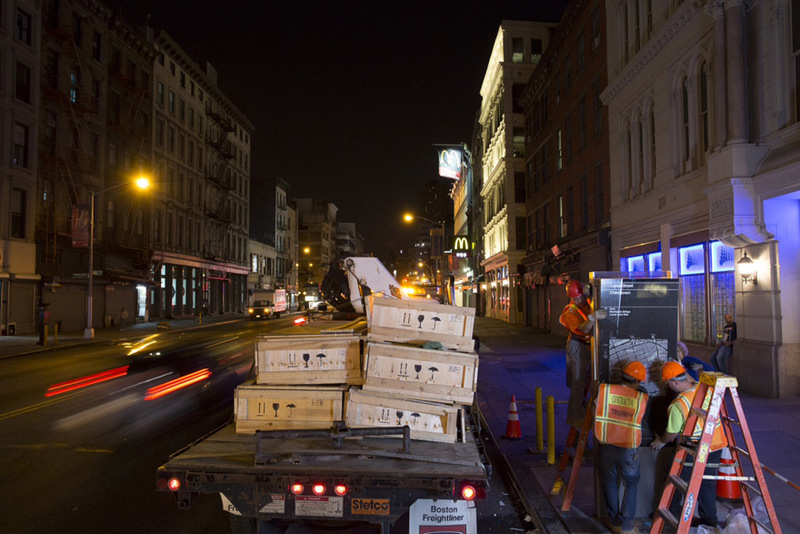 The first WalkNYC signs are being installed during the Summer of 2013 in four areas of the City. New York City is well-known as a walking city, but pedestrian-oriented information is difficult to find and inconsistent where available. The City's streets are a mix of named and numbered streets, with a variety of building numbering conventions, with street grids merging at confusing angles. Even Manhattan's simple street grid is difficult to navigate when emerging from a subway station or transit hub. While the City has many signs directing drivers, these provide very little benefit to pedestrians. The goal of WalkNYC is to remedy this information and navigation gap. In addition to the abutting grids of Chinatown, three other neighborhoods will see the new signage by the end of the summer—the commercial center of Herald Square, and the up-and-coming outer borough locales of Prospect Heights and Long Island City—to bring the total up to about 100 maps, with the goal of citywide coverage next year. I, for one, also happen to find maps to be aesthetically pleasing, and Pentagram has done a nice job of presenting the information (gathered by cartographers T-Kartor), and their planned ubiquity upped the ante for the NYC-based powerhouse. Project lead Michael Bierut related that "I did the bags for Saks Fifth Avenue and the logo for the anniversary of Grand Central, and I encounter the results every day, often unexpectedly. It would really be painful if I was unhappy with they way they looked. Same thing in this case. Luckily, we're really happy with the way the signs look." As with most understated designs, the elegant yet information-dense signage was a major project, involving more organizations than you can count on one hand: Besides Pentagram and T-Kartor, the NYC DOT also called on wayfinding specialists City ID, industrial designers Billings Jackson and engineers RBA Group to collaborate on the ambitious undertaking. (Together, they formed the a Volton-like design consortium known as PentaCityGroup—no joke.) Bierut spoke effusively about the team effort:Mike Rawlinson at CityID is very experienced at this kind of large scale civic project and he put together the perfect team: very collaborative, very open minded. It helps when each team member really understands their discipline and their scope of work, as was the case here. And it also helps when the job is so big that your own scope keeps so busy you have no time to meddle in other people's scope. Our job, figuring out the elements of the system's graphic language, turned out to be a real challenge. Knowing that the planning, industrial design, cartography, and engineering were all under control made it so much easier to keep our own energy focused. We had the chance to see Rawlinson present the NYC Wayfinding Signage at the PSFK Conference back in April alongside longtime collaborator Eoin Billings of Billing Jackson, who echoed Bierut's praise of the City ID team:Another advantage we had was a well-balanced design team, led of course by City ID, which pioneers this type of user-centered wayfinding system. The open and non-hierarchical collaboration City ID expects is refreshing when compared to our experience on some infrastructure schemes where power play and vested interest can get in the way of delivering the most efficient and effective solution. Some jobs are just a pleasure to do because the team works, the client is supportive and the end result is a genuine asset for the city. This was one of those. How did this project compare to previous public infrastructure projects you've completed? Eoin Billings: We've been lucky enough to work on several streetscape schemes in NYC, from the coordinated street furniture commission six years ago to the Times Square pedestrianization pilot and the Select Bus Service stations in Brooklyn. In every case our client has been the DOT under commissioner Janette Sadik-Khan, and it is probably the most progressive and inspirational city authority we've ever encountered. This is really important because public infrastructure projects inevitably involve so many stakeholders and interest groups that it's an achievement to get anything agreed and implemented... let alone as quickly as the wayfinding system. Although Billings Jackson is well-versed in fabricating products for public use, it sounds like you spent some time investigating materials and manufacturing for the Wayfinding signage. Did you work with local vendors? 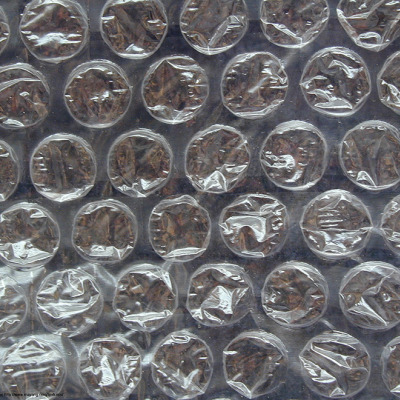 And do you intend to adapt the product for other cities or applications? We are all about materials and manufacturing techniques. 15 years ago, we designed a touring exhibition, Fusion, that explored design process by de-contextualizing architectural elements so that the innate qualities of what they were made of and how they were made were brought to the fore. We are still manufacturing nerds and are fascinated by the onset of any new technique and technology, particularly the advances in prototyping that liberate designers from a reliance on proprietary components. Our 'Civil Bench' for Forms+Surfaces is a case in point. Originally designed as a special for Lower Broadway, its unit cost was lower than any catalog alternative. When it came to the wayfinding totem, we knew that we wanted an aesthetic that was unique to NYC. The scale, materiality, detailing and graphics all respond to the city and would not be appropriate in Chicago or San Francisco for example. Materials for the street have to be robust and low maintenance of course and we wanted to express this strength while emphasizing the beauty and integrity of the individual components. This led us to reduce the palette to four key elements. 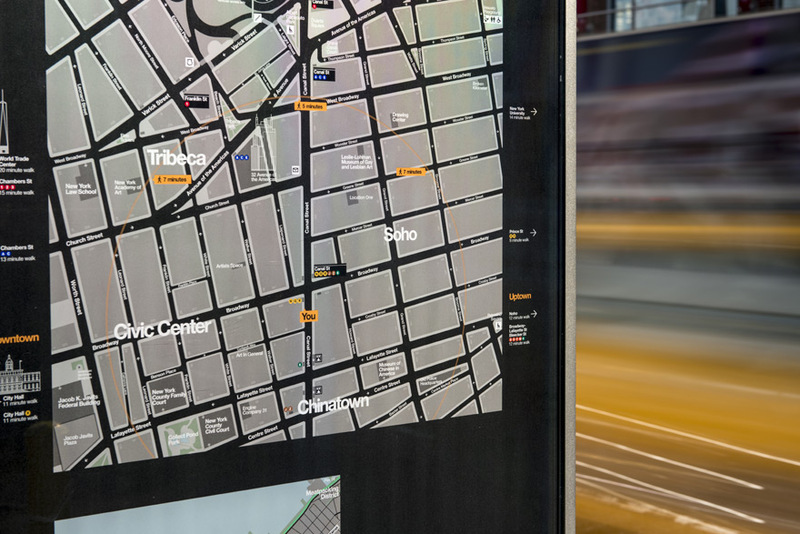 The stainless steel frame acts as a crisp outline to the heavy glass panel carrying the maps. The porcelain infill panel below it grounds the totem and the acrylic beacon does the reverse, creating an interesting tension that we feel lifts the totem from utilitarian amenity to a beautiful object in the street. The $15,000 pricetag is obviously a not-insubstantial investment in city infrastructure, but in the PSFK presentation, Rawlinson mentions the ROI (20:1); was the budget a major constraint for the project? Similarly, to what degree can the signs be modified or updated to incorporate new content, whether it is static or dynamic? The budget is a necessary parameter to achieving the best solution. 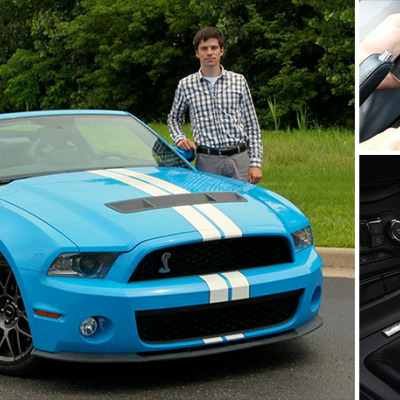 As long as it is realistic, as it was in this case, then it encourages a rigorous design process. I can think of no similar investment in urban infrastructure that would have anything like as significant an impact. 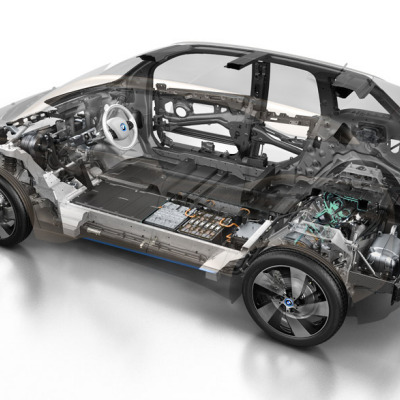 The totems can be modified, updated and indeed repaired without the need for full replacement, which is a key benefit of component-based design. The maps themselves are printed on vinyl, which is applied to the back of the glass panels and can easily be replaced. Rawlinson later refers to it as a 'digital platform,' at least to the degree that the content can be updated as needed. Did you spec out technological solutions, either a digital display or transmitters (Wi-fi / bluetooth / RFID / NFC etc. ), and/or can the signs be retrofitted for different purposes as the cost of these technologies drops in the future? The core information is all digital (as opposed to traditional hand-drawn maps), making this the largest mapping exercise of its kind. This digital technology is essential to rolling out the system citywide. 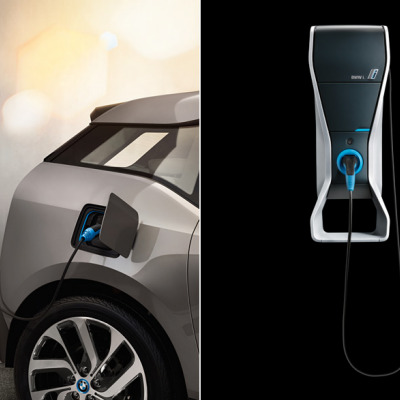 Of course, the signs can be further upgraded with digital displays etc.—the totems are future-proofed by being component-based, and by space for accommodating technology further down the line. Taking a step back, what do you think the wayfinding signage represents for the future of urbanization (i.e. they're expressly designed for pedestrians and mass transit users...)? 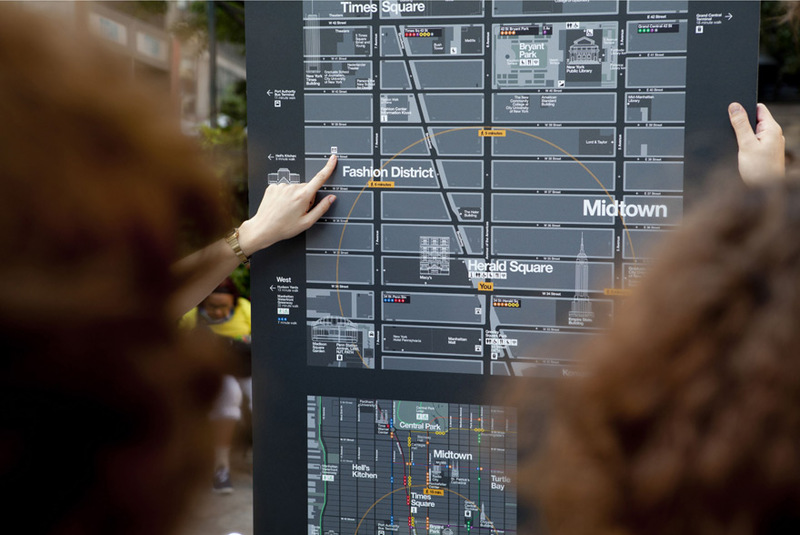 For us, wayfinding is the clearest expression yet of the understanding that cities function best when their infrastructure is conceived from the perspective of the individual who is going to use it. This user-centered design is humanizing our cities, with knock-on benefits to both individual and community well-being. City ID works in creating more transparent cities and opening up the environment in this way—taking into account everything from texture to vista to create a mirror of the city—is groundbreaking in terms of urban design.